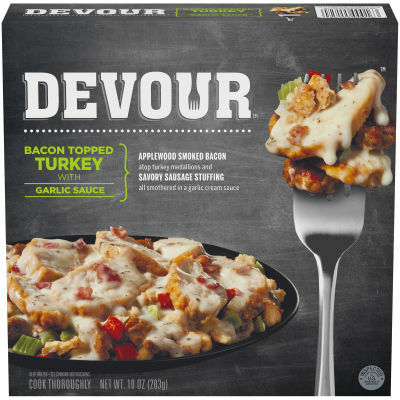 Bacon Topped Turkey with Garlic Sauce Quick and easy to cook, enjoy a mouth-watering meal of Bacon Topped Turkey with Garlic Sauce in minutes. Tender and juicy slices of turkey and savory stuffing made from Italian sausage and caramelized onions and bell peppers are smothered in a delicious garlic sauce with a sprinkle of crispy Applewood bacon. Quick and Delicious Lunch or Dinner This single serving meal can be warmed up in a microwave in minutes and Devoured for lunch or dinner. Each meal is 410 calories with delicious flavors and aromas in every filling bite.